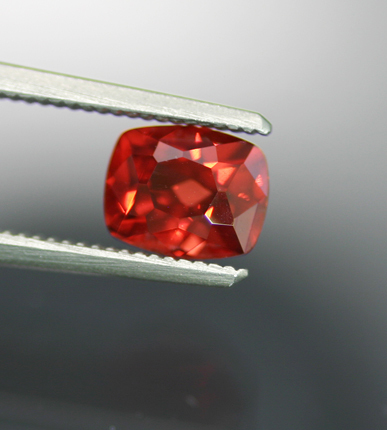 A classic Burmese 'flame' Spinel'. The color is that fine saturated red, touched with an orange modifier, that is unmistakable and highly sought after. We look and look for these to offer at competitive prices and are very lucky to be able to offer one a year at most. The size here is quite nice - large enough to give the stone a substantial presence, particularly in concert with this color. Oh, and yes, a US cut cushion! How unusual is that for a fine Burmese stone of this quality? With AGL Spinel Brief report.